Playgrounds should be safe and delightful areas for children. 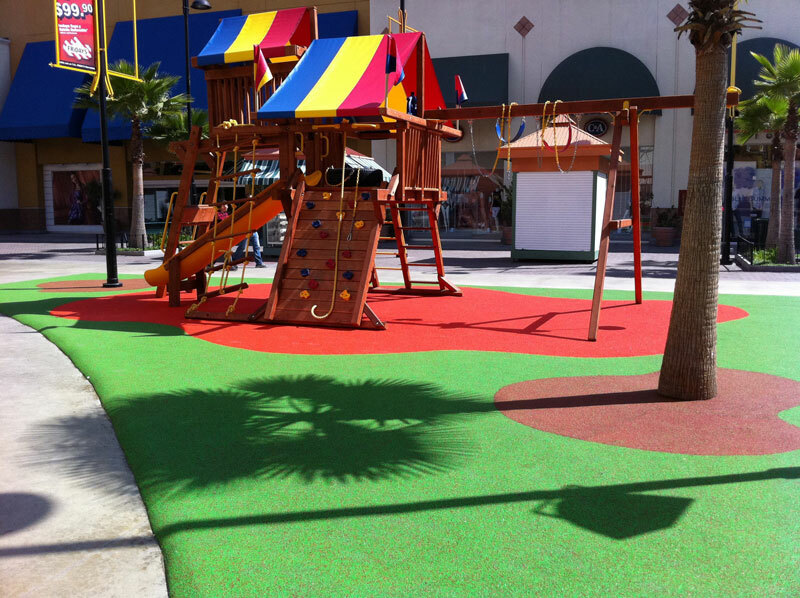 It is our promise as the best playground safety surfacing installation company in San Diego to provide the safest turf surface for your child’s play area. Our poured in place rubber playground has surfaces that are safe and tough enough to withstand the pressure from children playing in these spaces. Our playground safety surfacing consists of non-toxic rubber sourced from recycled tires, the surfaces are thick, firm and they have a shock absorbing quality that provides a safe cushion for the children. This is a unique rubber playground set up as a two-layer system with special protective features to ensure the safety of children of varying age groups. This playground is customized to feature safe fall heights; its upper layer is developed from color coated virgin rubber enhanced with an adequate binder troweled to form a layer over the shock absorbing layer at the base. The tough layer at the base if developed from shredded recycled rubber sourced from consumer tires with a varying thickness that has been determined by the appropriate critical fall height (CFH) of all equipment that will be set up on the playground. The experience with this customzsed playground for children is amazing. They can be created in a variety of warm and beautiful colors to achieve astonishing designs and patterns on the rubber playground surfaces. The rubber surface is non-toxic and environmentally friendly. Our business was established in the late 1990’s, and in over fifteen years, we have set up over 500,000 SF rubber surfacing materials to form the perfect poured rubber playground at various locations, as well as other different turf projects. We have a team of professionally trained workers at our offices across America; we are ready to begin the proper development and professional installation of your poured in place playground as soon as we get your call. Over the years, our designs have come to represent an outstanding artwork characterized by spectacular images, designs and color schemes that have been blended with the layer designs of rubber surfaces to complement the overall aesthetic features of the playground, parks and the other artificial turf projects that we work on. Our services are suitable for all your customized requests. We will install the perfect poured in a playground in sloppy areas, over mounds and contours to achieve an appealing visual outlook that will thrill the children. These designs are perfect for parks, schools, or day-care centers. Give us a call today, we will visit your location, and we will come up with a plan that utilizes your space adequately. This also applies to our synthetic playground turf, artificial turf for pets and golf putting greens. The safety features in playgrounds should never be compromised. Our projects are done to meet the standard specifications such as ASTM critical fall heights and Gmax standards for head impact. We assess data for ASTM fall height requirements and our adherence to ADA compliance is never compromised. We will show proof of our standard measures according to the safety provisions on request. We strive to install a playground for children that are environmentally friendly. Our work is compatible with technology characterized by multiple LEED credits, and we exceed the provisions for EPA requirements regarding heavy metal leaching. It is important to carry out regular maintenance on the playground surfaces to ensure its durability. We have artificial turf maintenance packages and high-quality materials for this purpose readily available. Playgrounds are suitable for children aged between 2-12 years. To get your free artificial grass estimate today, or if you have any questions about our great service, contact the professionals at the best playground safety surfacing installation company in San Diego.